The Hampton Inn Roxboro hotel is located on US 501 South /Durham Road/ and Route 158 East in Roxboro North Carolina just 20 miles north of Durham. Our Hampton Inn hotel is in the southeast section of Roxboro between downtown and the Person County Industrial Park. Area attractions nearby this Roxboro North Carolina hotel include the Rock Sportsplex the Person County Museum of History and the Roxboro Country Club. Within mile guests can dine at the Clarksville Station Golden Corral Vesuvio*s Italian Restaurant or Stuart*s Family Grill. 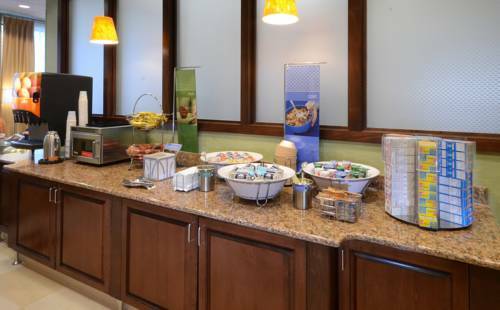 The Hampton Inn Roxboro hotel in North Carolina features 4 stories 80 interior corridor rooms /suites king and double rooms/ wireless internet service an elevator electronic card key outdoor pool exercise rooms in-room pay-per-view movies and a meeting room. Additional amenities of our Roxboro North Carolina hotel include complimentary deluxe breakfast bar /6am-10am/ USA Today complimentary local calls in-room coffeemaker iron/ironing board voicemail data port fax/copier and a 25** color TV with cable. The Hampton Inn hotel also offers cribs and rollaway beds. Laundry/valet services meeting/banquet facilities and audio/visual equipment are available to all guests for a nominal fee. We love having you here in North Carolina at the Hampton Inn Roxboro hotel.